A copper alloy plate with bell-shaped pendants dating to the medieval period. The object comprises a rectangular plate with three rivet holes, one in either corner at the attachment end, and another in the centre. The plate is folded over onto the reverse, and where it folds there are two rectangular slots cut out of the sheet. A bell-shaped pendant is held in one of the slots by a small rivet, and the vacant slot would have held a second example. The bell is hollow and would have encased the rumbler by the way of folded 'petals'. The attachment end is in the form of a small loop through which a rivet bar is threaded. The surface of the plate bears an incised decoration resembling a large letter 'W', though it is doubtful that it represents this letter. The decoration comprises a central stem with concave sides, and a curved line to either side. The function of this item is unclear. 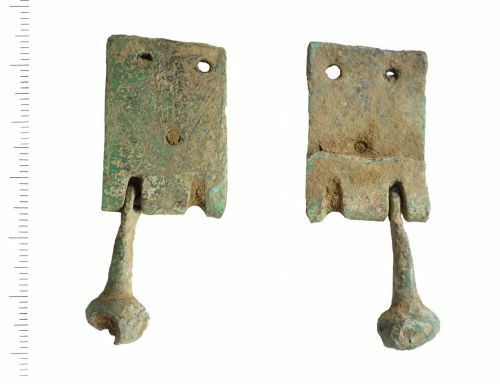 The presence of bell-shaped pendants suggests that it might have been used as a horse harness pendant. Single finds of bell-shaped pendants are relatively common (for example see SUSS-3EDC42 and SUSS-A99234) however more complete examples such as this are rare. ID done from photo sent by finder.